A review of single-source military equipment contracts has found that the Government could potentially save hundreds of millions of pounds by introducing new rules for industry the MOD announced today. Lord (David) Currie of Marylebone chaired the review of single-source procurement, which is currently subject to ‘Yellow Book’ rules - where only one defence supplier is invited to tender. Single-source contracts currently account for 40 per cent of all MOD procurement and in-service support of equipment. The Department is today launching a public consultation on how to take forward the findings of the review, which examines the UK’s existing framework for pricing single-source contracts and considers whether, in future, costs can be cut and efficiency increased while making UK industry more competitive on the world market. Current arrangements for single-source procurement have been in place for over 40 years and it is clear that they are no longer fit for purpose. That is why I asked Lord Currie to review them. I welcome his report and its recommendations to deliver better value for money to both our Armed Forces and the UK taxpayer. Through careful implementation, I would be disappointed if we couldn’t deliver savings rising to £200m per year - although I expect this will take a number of years to reach its full value. To examine the savings potential and the implementation of these recommendations, I am now launching an extensive consultation across industry and government. When Defence Minister Peter Luff asked me to undertake a review of the regulations surrounding single-source procurement of military equipment and services, it quickly became apparent that they needed to change. There are sound reasons why single-source will continue to represent a significant part of total MOD procurement. It is thus essential that the governing regime for this activity is robust and fit for purpose. This is the aim of our recommendations. I am encouraged by the changes the senior MOD team are already introducing to address the past problems of defence procurement. Our proposals aim to complement and strengthen these changes. Small and Medium Enterprises (SMEs) will provide fewer data-reporting requirements and there will be a simplified profit rate process. Larger contractors will provide an annual statement on how they have engaged SMEs in their supply chain. 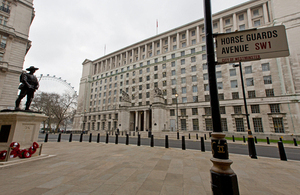 The report also suggests the new arrangements will provide greater transparency over the overhead costs industry attempts to pass onto the MOD. Lord Currie recommends these arrangements are overseen by an independent Single Source Regulations Office that would replace the existing Review Board to provide stronger oversight of both MOD and industry. This and other detailed recommendations are now subject to a public consultation across industry and government.